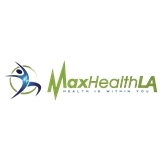 MaxHealth LA (Los Angeles) - Book Appointment Online! Everyone was great and very professional. I feel like they really cared about helping me and using the best methods and equipment they have.